The year is 2020, a tumultuous nine years after the Jan Lokpal Bill of Team Anna, by Team Anna and for Team Anna was ratified by Parliament. Touted as the panacea for the country’s ills, it was time for a review of its performance. To say that the setting up of the Jan Lokpal was a herculean task is the ultimate understatement. The start itself was inauspicious, with the formation of the first eleven -member Lokpal Board taking almost a year because of the politicking, backroom manoeuvring and downright skulduggery that marked the deliberations of the Selection and Search committees. This was hardly a surprise as these eleven nominated individuals would be the most powerful in the country, above the political executive and judiciary, and that too without any accountability. Then followed the monumental task of setting up anti-corruption units across the length and breadth of the country. On the basis of Team Anna’s yardstick of one vigilance officer for every 200 employees, the Jan Lokpal required 30,000 officers and a host of inspectorial and administrative staff for monitoring 4 million Central government servants and 2 million employees of Central Public Sector undertakings. In addition, the Jan Lokpal was required to set up anti-corruption units for other Central public servants covered under section 2(c) of the Prevention of Corruption Act 1988, such as judicial officers and staff, electoral officials, employees of registered cooperative societies receiving Central govt. assistance, employees of educational, social scientific, cultural institutions under the Central govt, and Central university employees including vice chancellors, readers, lecturers etc., not to forget the political class and the top judiciary. The sheer enormity of the task can be gauged from the fact that the Indian Railways alone required 7500 anti corruption officers and at least six times that number of inspectorial and support staff for monitoring 1.5 million employees, against the then existing strength of 150 vigilance officers in 2011. Railway employees are spread over 60 Divisions with an average manpower of 20,000 employees, 26 Zonal Headquarters and Production units, 21 Railway -Recruitment Boards, and 21 Railway Claims Tribunals. Apart from Indian Railways, there are 44 other ministries/departments of the central government, of which some such as Communications & IT, Civilian Defence, Home Affairs have more than 6 lakhs employees each, in offices across the country. Lokpal anti-corruption field units were to be set up to monitor all these employees. And there was the further requirement of setting up anti corruption wings for monitoring the two million employees of the 250 PSUs in addition to the judiciary, cooperative societies, educational scientific and cultural institutions. Explanatory note: This does not include theretired judicial officers and civil servants who are to conduct inquiries into the acts of corruption. The average annual wage bill per employee on the Indian Railways in 2011 was Rs. 3,78,781.Keeping this as the yardstick, the annual wage bill of Jan Lok Pal would be Rs. 8324.80crores at 2011 prices (does not includeinfrastructure cost of Jan Lokpal or cost ofInquiry officers, their staff, infrastructure, other minimum facilities etc). Selecting officers and staff for this behemoth was a veritable nightmare. As already spelt out in the Jan Lokpal Bill (sec 32) the anti corruption branch of CBI was transferred along with its employees, assets and liabilities to the Lokpal. After initial hesitation, the Lokpal Board also decided to merge the CVC and vigilance units in different Central govt. offices and PSUs along with their incumbents to the Lokpal. This was the first irony. Despite all the brouhaha about an independent authority to monitor the altogether suspect bureaucracy, the first recruits to the Lokpal were those much-maligned civil servants. But considering the overall staff requirements of the Lokpal, this induction was but a drop in the ocean. 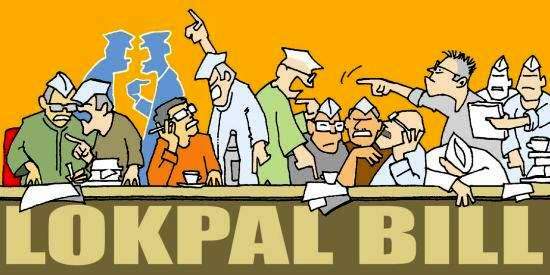 Armed with powers to appoint officers and staff (sections 4 (20) and 6 (k)), the Lokpal Board formed selection committees to recruit investigating and appellate grievance officers from the open market on pay scales equivalent to that of group ‘A’ officers. However, this method of recruitment had to be quickly abandoned as it engendered numerous complaints of favouritism, nepotism and motivated selections. Thereafter, the Lokpal had no option but to fall back on govt. agencies such as UPSC, Service Selection Boards, etc, for meeting the massive requirements. Scenting the whiff of the immense powers wielded by the Lokpal, the brightest and most ambitious young men and women applied for the Lokpal posts in preference even to the IAS, Customs and Income Tax. The venerable members of the Lokpal Board privately expressed anguish that the young hopefuls were driven by the lust for power rather than a desire to clean up a rotten system. The issue of the status of the new recruits posed a major problem. The Lokpal Board was of the view that they should not be treated as Governments servants. However, when it was pointed out that the Lokpal officials were being paid from the Consolidated Fund of India, and that the Lokpal had already absorbed the CBI and CVC govt. officials into its fold, the Lokpal Board reluctantly agreed to treat all recruits as Central Govt servants with matching pay & allowances. The Lokpal bureaucracy in all its purple splendour had kicked in. The training of the Lokpal recruits became another contentious issue. Some Lokpal members were of the view that a separate training facility should be set up to be named “the Institute of Truth and Integrity”. However, in view of the massive over runs in the Budget it was decided that the training would be imparted at government training institutes & colleges with one difference. The Lokpal Board insisted that there should be one training capsule on ethics and spiritual leaders such as Baba Ram Dev and Sri Sri invited to deliver lectures to the trainees. No sooner had the Lokpal Board been set up than hundreds of complaints started pouring in from all parts of the country. Despite the best efforts of the CVC and CBI Officials working in the Lokpal, the arrears kept accumulating. As no complaint could be closed without the investigating officer recording reasons for such closure, (section 10 (4) ), every complaint had first to be authenticated by contacting the complainant and then a preliminary enquiry done before decision could be taken either to close the complaint or pursue it further. By the time the full-fledged Lokpal field units had been set up, five years had already elapsed. A backlog of more than one lakh complaints of corruption were pending apart from hundreds of grievance complaints. With each passing day, the number of complaints grew as also the resentment against the Jan Lokpal. The magic wand was turning out to be a monstrous national liability. Apart from the internal problems, the Lokpal Board had to contend with the gang wars that broke out between the Lokpal officials on the one side and govt. agencies on the other. The Lokpal officials exercised enormous powers including ; i) ensuring compliance of their orders by imposing penalties on persons failing to comply with orders (section 6 (p) ); ii) requiring any public authority to render any specific help required by the Lokpal (Section 6 (v) ); iii) intercepting voice and data through telephone, internet etc; iv) imposing penalties of upto Rs. 50000/- on the grievance redressal officers; v) treating repeated violation of the Citizens Charter as an act of corruption, for which the minimum penalty was 6 months rigorous imprisonment. Innumerable complaints were received by the different Complaints Authorities regarding Lokpal Officials terrorising govt. servants with trumped-up charges in order to settle scores or pressure them into doing their illegitimate bidding. In retaliation, all kinds of criminal charges, some genuine and some fake, were heaped on Lokpal Officials by the governments agencies. Of the numerous complaints of corruption that kept piling up in the Lokpal offices, even those that were finalized ended in the law courts. According to the Jan Lokpal Act, a Bench of judicial officers who were either retired judicial officers or retired civil servants would, after enquiry, determine the quantum of penalty which “ shall be binding on the appointing authority” (section 22). Out of sheer fear of harassment by the Lokpal Authority, more often than not the appointing authority would endorse the recommendations of the judicial bench. However, the aggrieved officials invariably went on appeal to the High Courts which granted them relief on the grounds that there was “ no application of mind “by the appointing authority who had merely endorsed the recommendation of the Lokpal. According to the Courts, section 22 of the Lokpal Act was inimical to article 311 of the Constitution. The grievance redressal system spread across all 627 districts in the country was another costly misadventure. While each public authority dutifully enumerated its commitments to the Citizens Charter, and the time frame for fulfilling the commitments, the actual targets fixed were deliberately scaled down so that the grievance redressal officer, who was invariably the head of the public authority escaped the threatened penalties as also possible departmental disciplinary action. In fact, according to the Act, repeated violation of the Citizens Charter was to be treated as an act of corruption (Section-2(e) ) for which the minimum punishment was 6 months’ rigorous imprisonment. Grievance redressal officers who were punished by the Lokpal approached the courts in appeal inter alia protesting that they could not be held solely responsible for every failure in the organisation. Their appeals were upheld and one judgement even asked the rhetorical question whether the eleven-member Lokpal Board was willing to accept responsibility for the myriad failures of the officials under their command. The general consensus was that the Grievance Redressal machinery served no purpose except to demoralise the public servants. ​The Jan Lokpal produced other lethal side-effects. With the disciplinary powers largely usurped by the Lokpal, the top management in the various public authorities no longer felt it was their duty to ensure the all round health of the organization. The ruling mantra was “play safe”, as a consequence of which major decisions with financial implications remained pending and tenders were not finalized for months on end and then discharged. The end result of this all-pervasive apathy was a precipitate fall in industrial and agricultural production and spiralling inflation as corporates looked to other countries for investment. This apart, the law and order situation because unmanageable as various interest groups, adopting Team Anna’s strategy, used mobs and street protests to press their demands. ​The Jan Lokpal’s only success was employment generation through creation of a massive parallel oligarchy that outstripped every government department in size and power. While emasculating government and its institutions and arrogating all punitive powers of governance,this Frankenstein monster made no dent in tackling corruption but only slowed down an already lumbering government. The Jan Jokpal’s recurring cost to the Exchequer was more than Rs. 10,000 crores annually, apart from the immeasurable damage that it engendered in the form of organisational atrophy and administrative paralysis. ​Overwhelmed by the problems, the new JanLokpal Board revisited the original recommendation of the Administrative Reforms Commission 1966 which had limited the role of the Lokpal to monitoring the PM, Ministers, Parliamentarians and Secretaries to the Government of India. It is rumoured that the Board has endorsed this recommendation for immediate implementation on the grounds that the monstrously large Jan Lokpal was afflicted with the very ills of the agencies it monitored.The Board’s rationale for seeking a revised mandate was that it is the political executive and top bureaucrats who set the tone for any organisation as they are responsible for all major decisions. It was, therefore, appropriate that the Jan Lokpal concentrates on the key players in Government instead of dissipating energies across an uncontrollable spectrum. Mausam: A Good Try… But Will it Work?? ?